You know what’s better than a scoop of ice cream next to a cupcake? 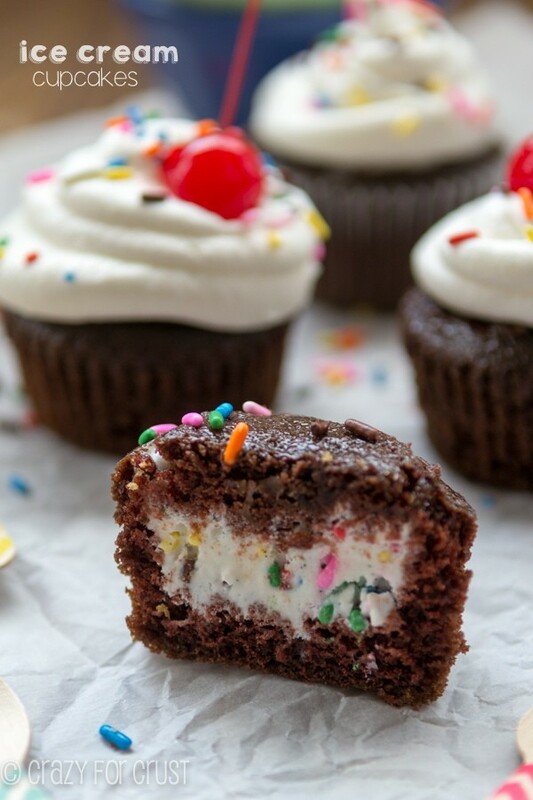 A scoop of ice cream that comes inside a cupcake. Stuffed things are always better – always. Last month a friend of mine shared a photo on my Facebook wall. The photo was originally from Duncan Hines (I think) but it was a photo of a cupcake with ice cream stuffed inside. She asked if I could teach her how to make them for her son’s birthday. I did one better than that. I made them for her – and for you. 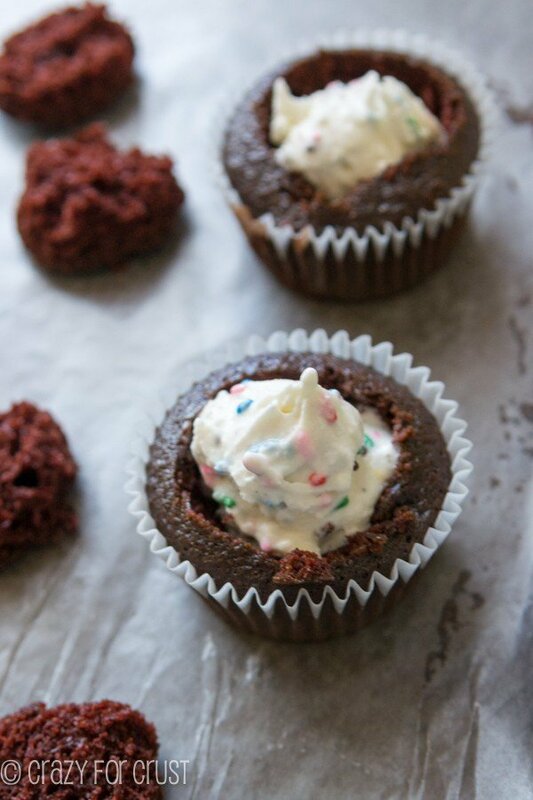 This way you can make your own ice cream stuffed cupcakes too! Because there is nothing better than dessert stuffed in dessert. Ever since Jenny first stuffed an Oreo inside a chocolate chip cookie, we bloggers have been obsessed with the two-in-one treat. Hmmm, that concept sounds familiar. Oh yes, it’s another way of saying “dessert mash-up” which I’m very familiar with. I wrote a whole book on dessert mash-ups, out this fall. It’s the perfect single serving dessert for when you want a cupcake…and ice cream too. And the flavor combos. Oh. My. Gosh. Think of the possibilities! The birthday boy requested chocolate cupcakes with vanilla ice cream. I’m me, so I offered to stir some sprinkles into the vanilla ice cream because everything is better with sprinkles. 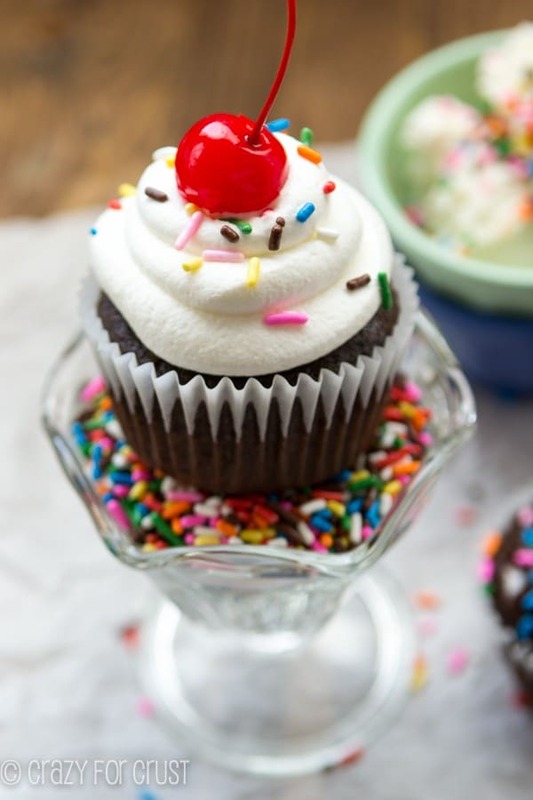 Once you know the method for how to make an ice cream cupcake, you can make whatever flavor you want. You can use a box mix or you can make them from scratch. I bet there are a gazillion combinations of ice cream cupcake you could make. And that number is probably accurate because I majored in math and know all about probability. And…about a gazillion more. Basically, what I’m trying to say is…go find your two favorites and pair them together. 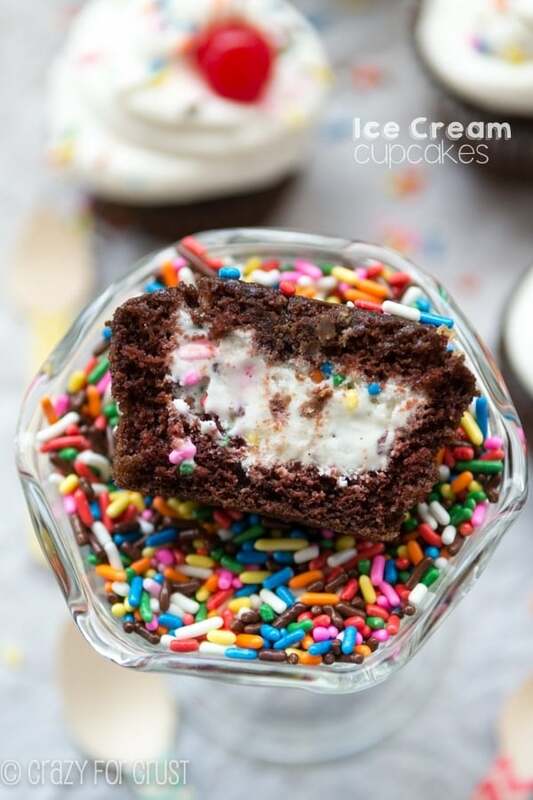 Okay, so are you ready to learn how to make these ice cream cupcakes? Let’s get started! Start with 24 baked and cooled cupcakes. Box or scratch, it doesn’t matter. 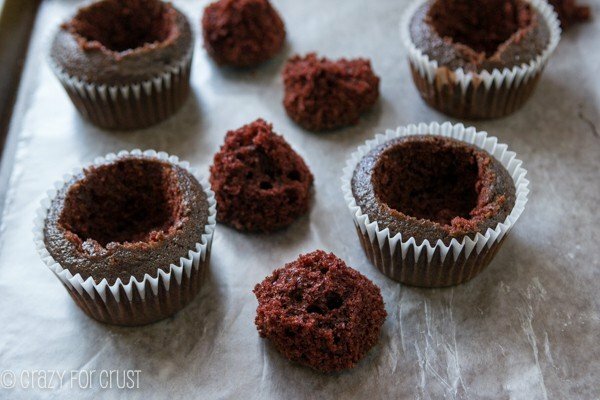 These are my favorite chocolate cupcakes. Cut a circle in the top about the size of a half dollar. Cut down deep and dig out a chunk of cake. It may be cone shaped. Then, cut off the end of what came out of the cupcake. Remember – ice cream is going in that hole. 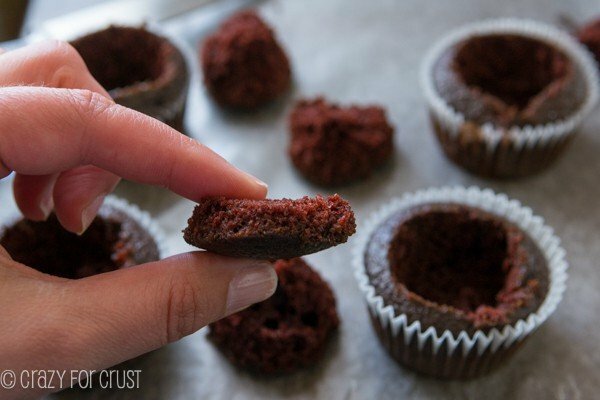 Not all the cupcake is going to fit back inside, so you need to get rid of it. Or eat it. I suggest you prepare all your cupcakes, then place a cookie sheet topped with wax paper in your freezer. Work in batches for the next step (about 3-4 cupcakes per batch) so that the ice cream doesn’t melt. Then top it with the top and place them in the freezer. You can wrap the cookie sheet with plastic wrap and freeze over night, or place these in a ziploc bag and freeze for up to 1 month. That’s the best kind of do-ahead I can ask for! Now, you’re probably thinking what about frosting? Don’t worry, I’ve got you covered there too. I topped mine with a dollop of Cool Whip before serving, but you can use your favorite frosting. The birthday boy who got these cupcakes requested vanilla so I made him a batch of the perfect vanilla frosting that goes with my vanilla cupcakes. Just have your frosting ready to go and frost right before serving. It makes these have way more combinations than a gazillion. We have to add another layer to that takes it up to a quadrillion, I think. These are perfect for any birthday, the 4th of July, or a random Wednesday. Because cupcakes and ice cream are always a good thing. Especially when they’re together, mash-up style! Cupcakes and ice cream all in one! 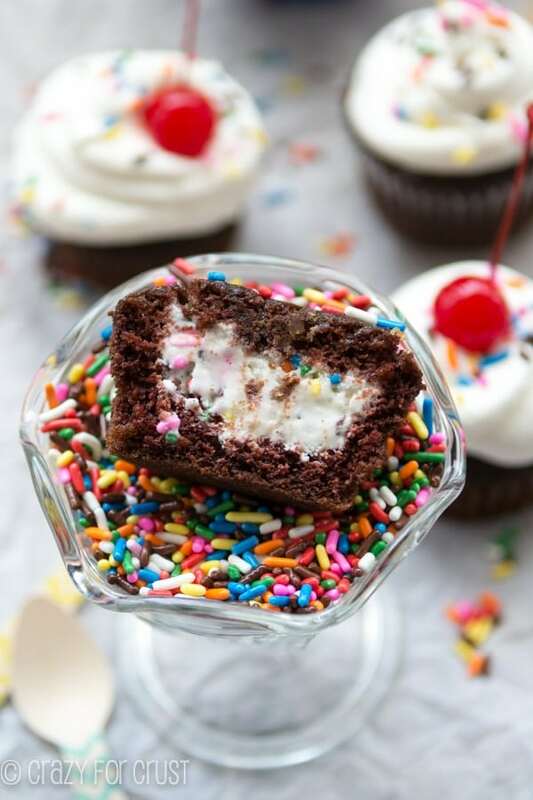 It's easy to fill your favorite cupcakes with your favorite ice cream to make one easy to serve and eat party treat. The method is super easy - and the options for flavor combinations are endless! 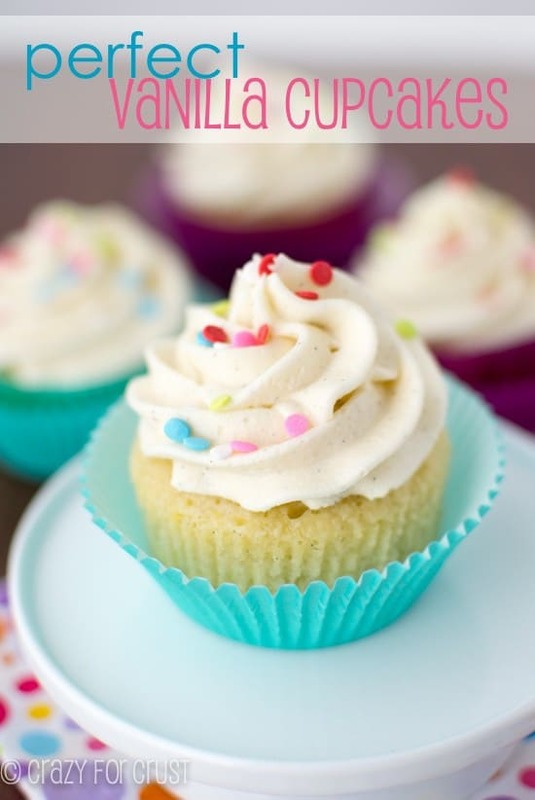 Use your favorite flavors to make your favorite ice cream cupcake! Start with 24 cupcakes that have been baked and completely cooled. You can use your favorite flavor box mix, or your favorite from scratch recipe. 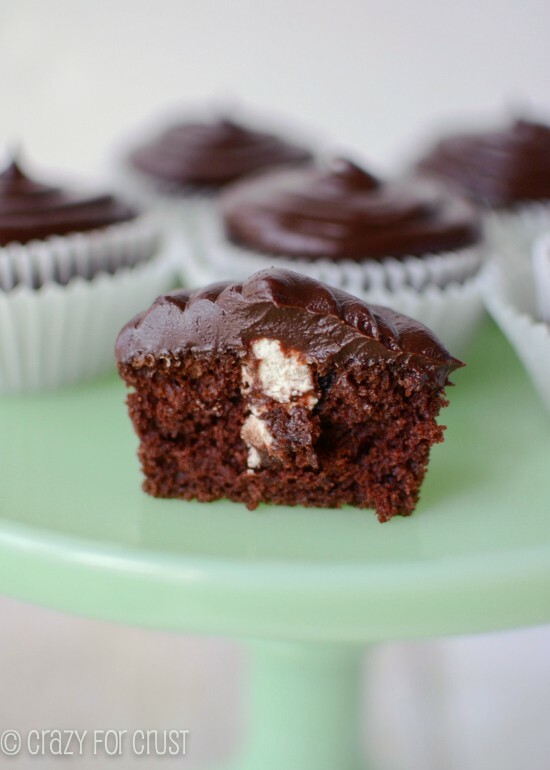 (Consider using my chocolate cupcakes or vanilla cupcakes if you want a from scratch cupcake.) 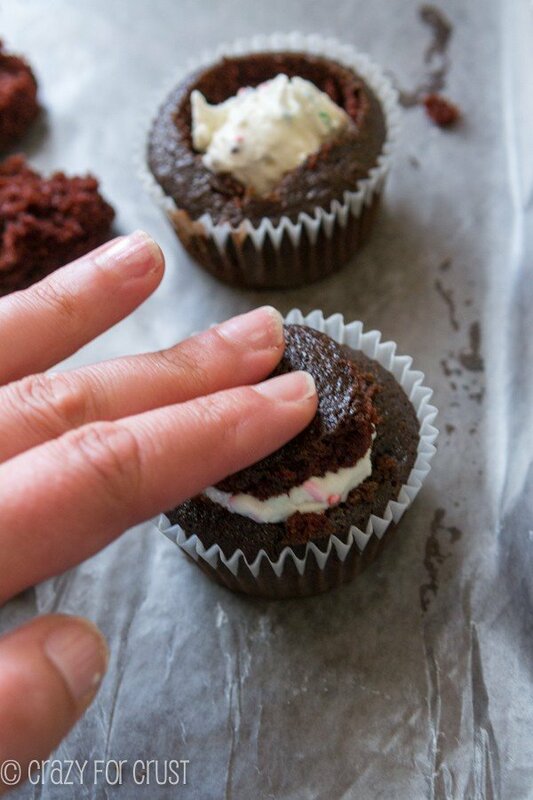 Place the cupcakes on a cookie sheet lined with wax paper. Make room for a second cookie sheet lined with wax paper in your freezer. Ziploc bags and freeze for up to 1 month before serving. When ready to serve, have your frosting or a thawed carton of Cool Whip ready. 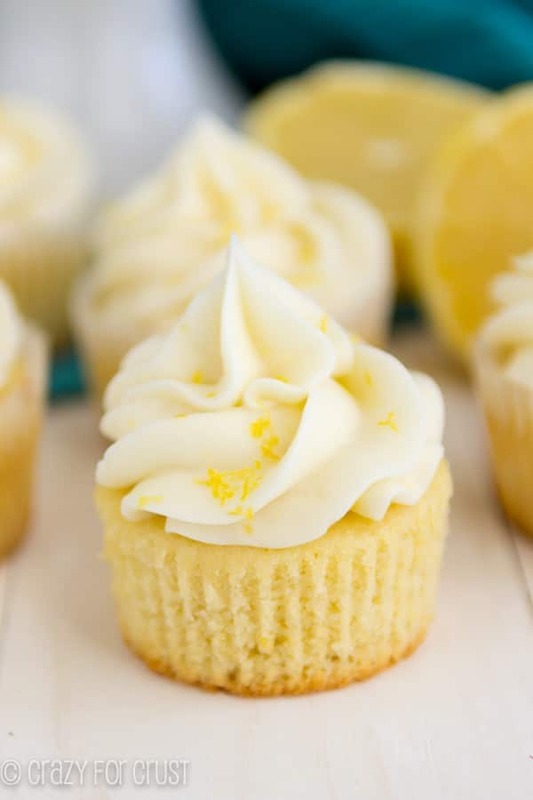 Remove a cupcake from the freezer, frost as desired, and serve immediately. 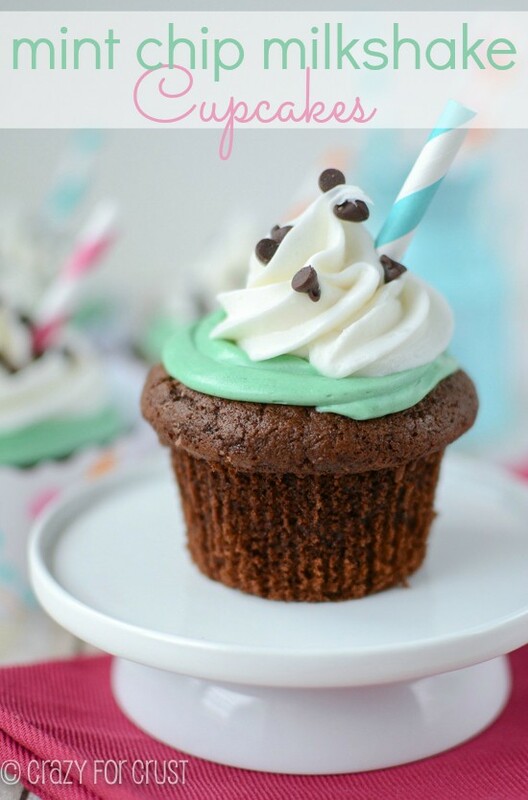 (For an amazing chocolate frosting recipe try this one or for vanilla, this is my favorite. Find your favorite flavor cupcake and then pair it with some ice cream! I want these for my birthday! Two desserts in one is always better then one! or something like that! I want to chocolate cupcakes with peanut butter ice cream, that would be amazing!! What type of icing did you use for the cupcakes? It will not work to have frozen butter cream or otherwise would it? I used Cool Whip because it was easy. If you want to use buttercream or regular icing, I suggest frosting them right before serving! My question is how long does it take to defrost the cupcake, I have made these for a party, but am worried that they will be too hard to eat, as need to defrost the cupcake.